The refusal of the global temperatures to rise as predicted has caused much angst among academics. "The fact is that we can't account for the lack of warming at the moment and it is a travesty that we can't," wrote one in 2009. Either the instruments were wrong, or the heat energy had gone missing somewhere. Now a team of academics, after tweaking a statistical model to include sulphur emissions, suggest that coal power stations may be to blame for a lack of global warming since 1998. The IPCC's 2007 assessment acknowledged the negative radiative forcing (aka, cooling effect) of both natural aerosols from volcanoes and manmade aerosols, but admitted the level of scientific understanding was low. A team of two geographers and two economists headed by Professor Robert Kaufmann at the Department of Geography in Boston publish their results in a new paper Reconciling anthropogenic climate change with observed temperature 1998-2008 [PDF], which includes manmade emissions of sulphur and simulates the flat temperatures since 1998. Kaufmann has a PhD in energy management policy. 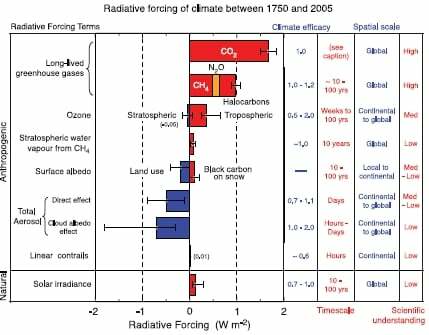 In this paper, he and his colleagues revisit "a simplified model" from 2006 (PDF) containing statistically estimated equations for three variables: global surface temperature, CO2 and CH4. The actual temperature differences described in the new paper are tiny – with variations from model predictions of 0.1°C. "Results indicate that net anthropogenic forcing rises slower than previous decades because the cooling effects of sulfur emissions grow in tandem with the warming effects greenhouse gas concentrations. This slow-down, along with declining solar insolation and a change from El Nino to La Nina conditions, enables the model to simulate the lack of warming after 1998," the team explains. The model estimates a 0.06W/m2 increase in cooling since 2002. Declining sulphur emissions between 1990 and 2002 – caused by the collapse of the Soviet Union and the switch to gas – had a warming effect of 0.19W/m2. Kaufmann et al declare that aerosol cooling is "consistent with" warming from manmade greenhouse gases. Recent studies suggest greenhouse gas emissions may be masking a long-term cooling trend as solar activity declines. Climate scientist Judith Curry, chair of the School of Earth and Atmospheric Sciences at Georgia Institute of Technology, doesn't find the economists' statistical theatrics convincing. She wonders why the short-lived regional increases in particulates should have a global effect on temperatures. She also notes that there has been no increase in aerosols, either globally or over East Asia, from 2000 to 2006; Chinese emissions only rose in the period 2004 to 2007. Kaufmann et al do acknowledge that a La Nina weather pattern cooled the planet between 1998 and 2000, while a warm El Nino increased temperatures in 2002 and again in 2010. "The political consequence of this article seems to be that the simplest solution to global warming is for the Chinese to burn more coal, which they intend to do anyway," writes Curry.